One of the things I like about this hobby is there is always something new to learn. 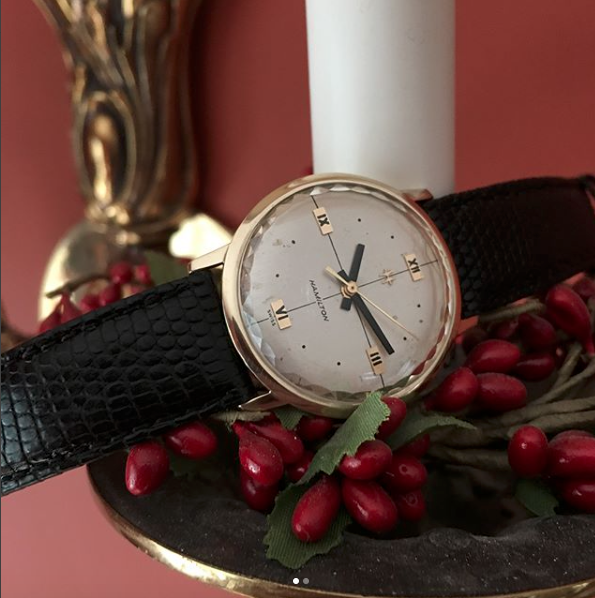 A lot happened over the 50 or so years that Hamilton made wrist watches in Lancaster PA. If you want to expand your knowledge of all-things-Hamilton you can include pocket watches and include a couple of more decades. I recently came upon a watch on eBay that I couldn't identify. It looked familiar but also very unique. I thought it might have some serious issues though so I passed on it. Then a fellow collector contacted me after he purchased the watch. So it came my way after all. Once I had it in my hands I was able to identify it as a 1966 Thin-o-matic T-416. This model only shows up in the 1966/67 catalog so it's not a commonly found model. 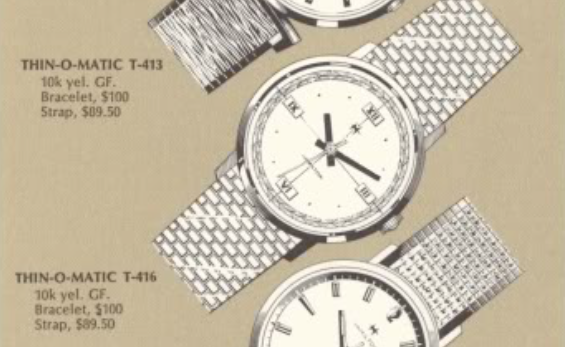 The T-416 is unique because it doesn't say Automatic or Thin-o-matic on the dial. It has a 10K yellow gold filled case and came with bold black hands and very subtle black dots and roman numeral hour markers. It also has a faceted "diamond-edge" acrylic crystal. The watch I received was very puzzling to me originally. It thought it might be a "sea something" since it has a Swiss movement and generally has that "sea-something" look about it. My very first impression was it looked to me like there were holes at the 2, 4, 5, etc. marker positions and maybe the dial was missing a bunch of hour markers. I also noticed that the 1 and 8 positions appeared to be filled holes. The dial itself is in poor condition and there's a lot of excess glue or something around the crystal. Those were all the reasons I passed on this watch when I saw it for sale. Looking very closely at the dial, it looks like the "holes" are just black dots. The 1 and 8 positions are just missing the black part in the center of the circles. With the crystal and the crown removed, the movement can be lifted out of the case. This dial has definitely seen better days. I will try to gently clean it and then give it a "poor man's refinish" with a light coat of clear lacquer. Here was my first clue as to what model this could be... it has a Hamilton 623 movement. That would indicate that this is a Thin-o-matic, even though dial doesn't say that. The inside of the now-cleaned case back has two numbers... the lower one ends in 66 and that tells me this is a 1966 model. Now I know it's a 1966 Thin-o-matic T-4-something, as the gold filled case would imply this is a 400-series model. How's that for deductive reasoning? The hour hand is pressed right up against the dial and looks like it has rubbed the center of the dial a bit over time. It's also too close to the dial for me to get my hand remover under it. Rather than risking scratching the dial, I just removed the dial from the movement and took the hour wheel and hour hand off in the process. Now I can lift the hour wheel out and remove the hour hand in the process. The old crystal will be tossed but first I can use it as a little dish for black paint while I fill the 1 and 8 hour positions. The movement is cleaned and dried. Time for reassembly. The movement, sans-rotor, is ticking away with good motion. Fortunately there was no rust at all on the stem, that can be the hardest part to replace. Ticking with a beat rate that is just a smidgen fast at +22 seconds per day. I'll leave it like this for now as it should slow slightly as everything settles back into place. One of the distinguishing features of this model that the project watch was lacking was a faceted crystal. A new replacement will correct that. Well, this a totally different watch now, don't you think? There's only so much I can do with a horrible dial but I think I made it a little less horrible. My light tent is merciless. The new crystal and polished case are definitely improvements. Here's another shot of the watch in more flattering, and realistic, lighting conditions. I think my friend will be happy he bought this watch now. I almost regret not buying it myself, now that I know what it is. I say "almost" because I got to see it and work on it anyway. So this was a win-win if there ever was one. Merry Christmas and Happy New Year Dan! I found a Sea Mate II that is absolutely new. It really contrasts my other Sea Mate II that I thought was pretty nice. This one has very sharp edges and a stock gold JB bracelet. Did not know how worn my other one is. I also have a A608? Running but the dial is shot. When I cleaned it I cleaned off all the printing. Are you in need of such a watch (A 608)?